The availability of high quality roles and the Irish lifestyle convinced Mike Hartwell to move to Ireland from his native Australia, where he is currently head of investment management at Deloitte. 1.What is your educational background? I have a Commerce degree from the University of Queensland and am also a member of the Institute of Chartered Accountants in Australia and the Institute of Chartered Accountants in England and Wales. 2.What has been your career path to date? 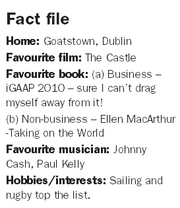 I worked with Deloitte in Australia for 5 years before making the move to Ireland. I’ve been with Deloitte’s Financial Services Audit group in Ireland for the last 15 years, and in the last 6 years have been working primarily in the investment management industry. I have just been appointed head of our Investment Management group. 3.Are your peers from similar backgrounds? I would say it is a mixed bag. Obviously, a lot of my colleagues here in Deloitte have a similar background in accountancy but we also have many people working here from a vast array of disciplines including engineering, law, technology and science – reflecting the diverse range of industries that we work in. And of course we have plenty of nationalities represented in the firm – it’s definitely a multi-cultural team here at Deloitte. 4.Have you worked abroad? If so where and what did you do? Would you do so again? Well I really am working abroad at the moment! And looks like I will be here for a while anyway – unless I get a better offer! Seriously though I am often asked why I choose to work here when I could be in sunny Australia but I do think Ireland has a lot to offer in terms of quality roles and I thoroughly enjoy the lifestyle here. 5.How would you compare career prospects internationally to those in Ireland? I do think there are still worthwhile opportunities here in Ireland in the investment management industry. The industry here has a lot to offer and while there may not be as many job opportunities as there were in previous years, the industry will always need talented individuals who will ensure the Ireland remains as the location of choice as a fund domicile and for fund administration. 6.Have you undertaken any additional professional training since assuming your current role? The life of an accountant is one of constant training! And with an ever increasing amount of regulatory change set to come our way, it looks like this isn’t about to change any time soon. 7.What skills/aptitude would you identify as being key/beneficial to a career in your sector? Working in a client facing role I would say that communications skills are particularly important. Sounds obvious I know, but dealing with a large number of clients means dealing with all different sorts of personalities! It’s important to gauge how to communicate effectively with each and every client and what style suits them best. Only then can you provide the best quality of service to them. 8.What aspects of the job do you like most? I would say the diversity of the job – I enjoy working with numerous clients and the different challenges this presents. I also enjoy working in the investment management industry which has been one of Ireland’s great success stories, despite the more challenging times recently. And it’s great to be part of an organisation like Deloitte where there is always plenty going on – be it team nights out or charity fundraisers – which can sometimes be a welcome distraction! 9.What aspects of the job do you like least? I guess over the last year the contraction in the market has been particularly tough. It’s been very frustrating to see companies suffer under the adverse operating conditions and we have seen a number of players leave the marketplace. I really feel this is a shame as the investment management industry is so dependent on international developments – and is something that we have very little control over. 10.How do you define success in your sector? I genuinely believe there is a unique opportunity for Ireland to grow as a domicile of choice for investment products if it continues to be at the forefront of the changing regulatory environment, if it continues to enhance its competitiveness, and is able to maintain its focus on providing world class client service. Maintaining and improving on Ireland’s standing in the industry defines success for me. 11.Is there anyone in particular you admire in your industry? I admire many with the investment management industry. Personally I admire anyone that has managed to create successful investment management businesses which have survived through the market turbulence of the last 18 months or so. We are lucky that we have many clients who fit into this category. 12.What advice would you give to others who might like a career in your sector? 13.In what areas are there the most opportunities in Ireland? IFSC/domestic etc. Working in the investment management industry I am certainly going to give it a plug! But I do think there is still huge potential for the investment management industry here in Ireland. We have an opportunity to really position ourselves as a major player internationally. Our approach needs to be right – and we must remember despite the challenges that exist, many of the factors that led to our success are still important – including our talented people, quality of the work undertaken in Ireland, flexible and appropriate regulation and competitive costs of doing business. We also now have a proven track record as a location of choice.